Justin Byers was hit and killed by a truck. His brother, Casey, was killed by a bomb in Iraq. Denison, Iowa. - Ann Byers of Schleswig sobbed loudly as she received hug after hug at the Iowa National Guard armory Tuesday. In a little more than a week, she had lost both of her sons. 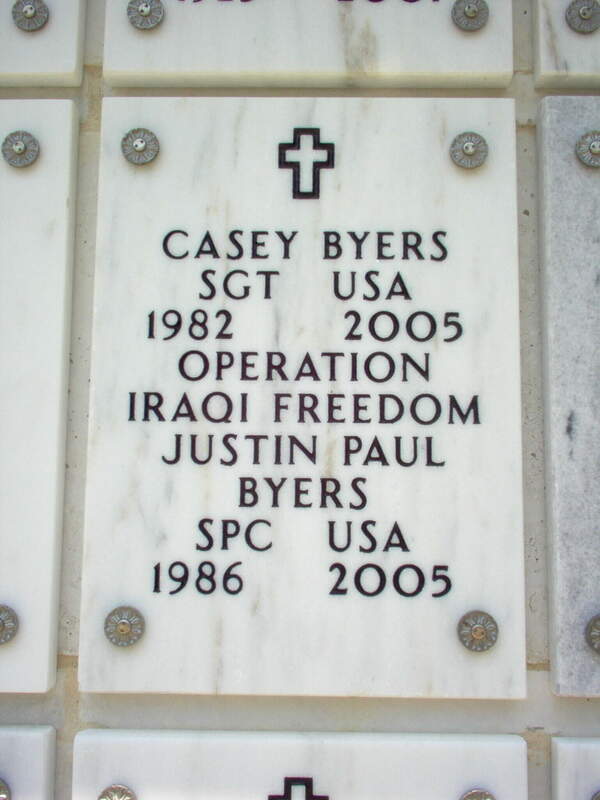 The visitation Tuesday was for her oldest son, Sergeant Casey Byers, 22, who died June 11, 2005, south of Ramadi, Iraq, when a bomb detonated under his armored Humvee. Then Monday night, the unthinkable happened: Her younger son, Justin "Paul" - who had been the family spokesman following his brother's death - was hit and killed by a truck. "I can't believe the people can be standing up there," Schleswig Mayor Carlton Petersen said of Byers' parents, Ann and Bill, who stood through a six-hour visitation Tuesday. "I don't even think it's soaked in yet, the second one." Justin Byers' death came just weeks before his own military unit, the U.S. Army Reserve transportation company of Sac City, was slated to be mobilized, said Lieutenant Colonel Gregory Hapgood, a spokesman for the Iowa National Guard. The unit is scheduled to leave for Iraq in the fall. Family members declined to comment Tuesday, referring all questions to Hapgood. "All things considered, they're doing as well as can be expected," Hapgood said of the Byerses, whom he described as a tight-knit family. "This is just an absolute tragedy. The average family can't possibly understand how you can deal with this and stay intact." Justin Byers, 19, was struck by a pickup truck just after 9:40 p.m. Monday, one mile west of Vail on U.S. Highway 30, said Iowa State Patrol Trooper Chuck Downing. Downing said Byers came up out of a north ditch. He said the driver of the truck, Mark Schurke, 42, of Vail, was unable to avoid hitting Byers, who was the only pedestrian there. Byers' vehicle was not near the accident site, and the closest house was at least half of a mile away, Downing said. "When I went out this morning, the neighbor boy, he came over and told me," said Dale Crane of Vail, a town of about 450 residents. "It's terrible for the folks. And the guy that hit him, we knew him." Schurke, contacted Tuesday by The Des Moines Register, was upset about the accident. "It's really bothering me," he said, declining to say more. An autopsy on Justin Byers was completed Tuesday, but officials were not releasing results. The Byers family has lived in Schleswig, a town of about 850 residents, for four years, Mayor Petersen said. Flags flew at half-staff Tuesday in Denison and Schleswig. Tents and picnic tables from the country club were set up outside for visitors to the Byers' home on U.S. Highway 59. "I just grieve for the family," said Janet Gritten of Odebolt, a family friend. She said she wasn't surprised that the Byers decided to proceed with Casey's visitation and funeral, despite Justin's death. "They needed to honor Casey. Casey was a hero, and he deserved to be honored." Casey Byers, who had an infant daughter named Hailey , was remembered Tuesday as fun-loving and the class clown among 32 classmates who graduated from Ar-We-Va High School in 2001. His funeral will be held at 11 a.m. today at the Iowa National Guard armory in Denison. 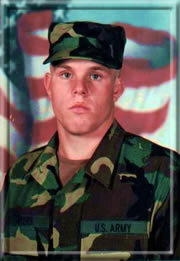 He was the 28th Iowan to die in Iraq since the war began in March 2003. "He was really fun . . . trying to look up girls' skirts, just always being a joker," said Ashley Laubscher, 22, of Vail, who said she met Casey when she moved to the area in the fourth grade. "Casey lived for today," said Barry Bergamo of Denison, a member of the Veterans of Foreign Wars Post 2504. "He was a good kid. Full of energy. If I was in charge of the unit, I would want more Caseys." On Tuesday, two soldiers guarded Casey's flag-draped coffin as a line of family and friends filed into the warm, dark room at the armory to pay their respects. Two tables displayed photos of the smiling family of five, which had tragically been reduced to three - the parents and sister Jennifer. "I gave my sympathy and remorse for Casey, and I asked them about (Justin), and they said that today was Casey's day," said Lawrence Thelen of Vail. "They've got a lot on their shoulders right now. One's bad enough, but two?" Casey's cremains will be inurned soon at Arlington National Cemetery. "He died in combat. He was doing his job, protecting others," Bergamo said. Funeral arrangements for Justin Byers were still pending Tuesday. When Army Spcecialist Paul Justin Byers stepped into the path of a pickup just two days before the funeral of his brother, Sergeant Casey Byers, a medical examiner suggested his death might have been suicide. It was an accident, the Crawford County medical examiner ruled Friday. Byers, 19, of Schleswig, was killed Monday night on U.S. Highway 30 near Vail. His 22-year-old brother was killed June 11, 2005, in Iraq when a roadside bomb exploded. Crawford County Medical Examiner Dr. Dennis Crabb told reporters earlier this week that the teenager's death was a suicide, "but then I backed off a little bit because I talked to a trooper and he was a little upset that I talked to all these people." On Friday afternoon, Crabb met with the Iowa State Patrol to review additional evidence. "It is the conclusion of the Crawford County medical examiner that this incident was, and shall be, considered to be an accidental death," Crabb said. Iowa State Patrol Trooper Chuck Downing said the investigation was continuing. Telephone messages left for the driver of the truck, Mark Schurke, 42, of Vail, were not immediately returned. Adam Schoenseld, 17, of Schleswig, refused to believe that his best friend committed suicide. "It had to have been an accident," Schoenseld said. "He wouldn't want to hurt people and you've got to know if you're going to do that you're going to hurt people. "His mom said if he planned it he would have said goodbye," Schoenseld said. He thinks Byers may have been out drinking with friends Monday night, was "just messing around and he ended up on the side of the road there." "He was probably drunk and he was upset," Schoenseld said. Schoenseld said Byers looked up to his older brother and wanted to go to Iraq to help people. He was a member of the U.S. Army Reserve transportation company of Sac City. In a letter written before his death, Paul Byers said he joined the Army, like his brother, to get money for college, but soon learned there was a greater cause at stake and was proud to represent his country. The letter, meant to be read at his brother's funeral, was read by Casey Byers' commanding officer, Colonel Tom Orr. "If I could say anything to him, it would be, 'Yes, Casey, I'm exactly like you and I stand here today proud to say it," the letter said. "I will not cry for my brother because I know he would not want me or any of you to." Paul Byers' funeral was scheduled for Saturday. Casey Byers' funeral was held Wednesday. He was cremated and his remains will be buried at Arlington National Cemetery in Virginia. "He was a really good guy and I looked up to him a lot," Schoenseld said of Paul Byers. "I just wish he could be here today talking to us." Two Iowa soldiers from Crawford County who died recently will be buried in Arlington National Cemetery in Virginia. 22-year-old Sergeant Casey Byers of Schleswig was killed last month when a bomb exploded beneath his armored Humvee while he was taking part in mission in Iraq. Byers' brother, 19-year-old Specialist Justin "Paul" Byers died about a week and a half later when he was struck and killed by a pickup truck after walking out of a roadside ditch near Vail. The family has learned that the brothers will be buried next to each other in Arlington National Cemetery. Justin will be buried on 3 August 2005. DENISON, IOWA - Brandon Laubscher is scheduled to appear next Monday on charges he supplied alcohol to his friend Justin Byers last summer, which resulted in Byers' death. Byers was killed instantly June 20, 2005, when he walked out of a ditch and into the path of a pickup truck traveling west on Highway 30 hear Vail shortly before 10 p.m.
Laubscher, of Vail, turned 22 Monday. A family member said neither he nor the family had any comment about the charge. He is accused of providing beer to Byers, 19, of Schleswig, during the afternoon and evening of June 20, according to trial information filed by Crawford County Attorney Tom Gustafson. The charge, supplying alcoholic liquor or beer to a person under legal age resulting in death, is a Class D felony. Bail was set at $6,500 and Laubscher posted the necessary bond amount and was released. According to Gustafson's office, Byers had returned to Schleswig from college in Fort Dodge after learning the Army Reserve unit he was serving with was to be deployed to Iraq. A few days prior to the accident that killed him, Byers learned that his brother, Casey Byers, had been killed while serving with the Iowa Army National Guard in Iraq. The funeral for Casey Byers was pending when Justin Byers was struck and killed. Crawford County Medical Examiner Dr. Dennis Crabb had originally said Justin Byers' death appeared to have been an intentional act, unless an autopsy revealed otherwise. He later ruled the death to be accidental. Rev. Chris Burnette, pastor of Schleswig's United Church of Christ, presided at both brothers' funerals. He said he did not know the specifics of what happened the night Justin Byers died. Justin Byers was a specialist with the 482nd Transportation Company, U.S. Army Reserve, based in Sac City. The unit was scheduled to be deployed to Iraq, but no deployment date had been set at the time of his death. Sgt. Casey Byers, 22, was a member of the Iowa Army National Guard in Denison. He was killed June 11 during route clearing operations south of Ar Ramadi, Iraq, when an Improvised Explosive Device detonated directly underneath the armored Humvee in which he was the gunner. Justin and Casey Byers, sons of Ann and Bill Byers of Schleswig, are buried at Arlington National Cemetery. Justin Byers was a 2004 graduate of Denison High School and twice qualified for the state wrestling tournament.